Late summer is when tough succulents really shine. Large agaves handle summer heat, and are unfazed by harsh sun, high temps and lack of rain. Their statuesque, fountainlike forms lend a sculptural element to any landscape, and contrast beautifully with fine-textured ornamentals. They also make good firebreak plants and security fences. With the exception of a few soft-leaved and variegated varieties, agaves want sun—the more the better in all but desert climates. Most are hardy to the mid- to high-20s F, and some go a lot lower. Sharp points at leaf tips and along leaf edges can make agaves treacherous. I snip about a quarter inch from leaves’ needlelike tips with garden shears. Agaves smaller than basketballs make excellent potted plants. 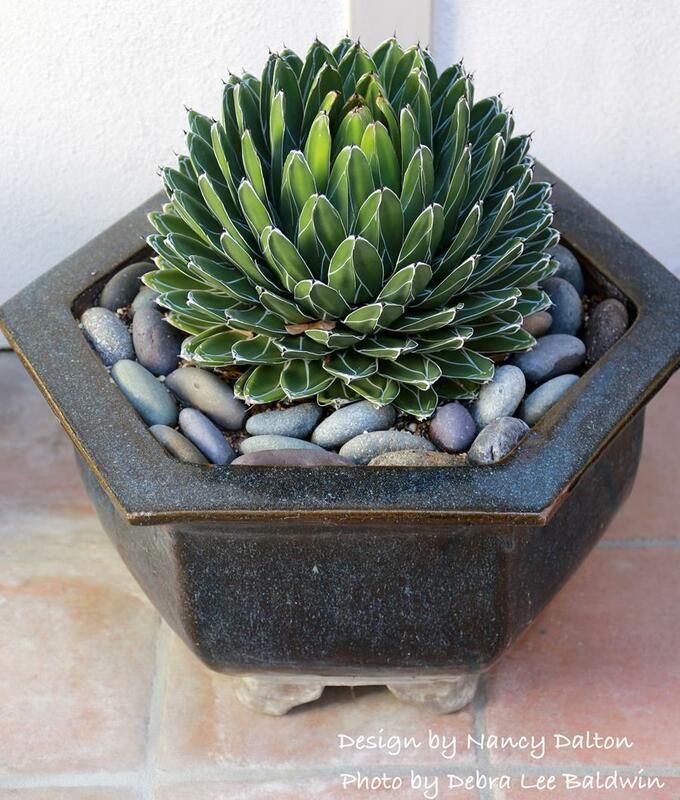 Small agaves—there are many exquisite ones—look good displayed one to a pot. Agaves with serpentine terminal spines and prominent teeth along leaf margins are both graceful and fierce. Don’t they remind you of how cats yawn and show their fangs? 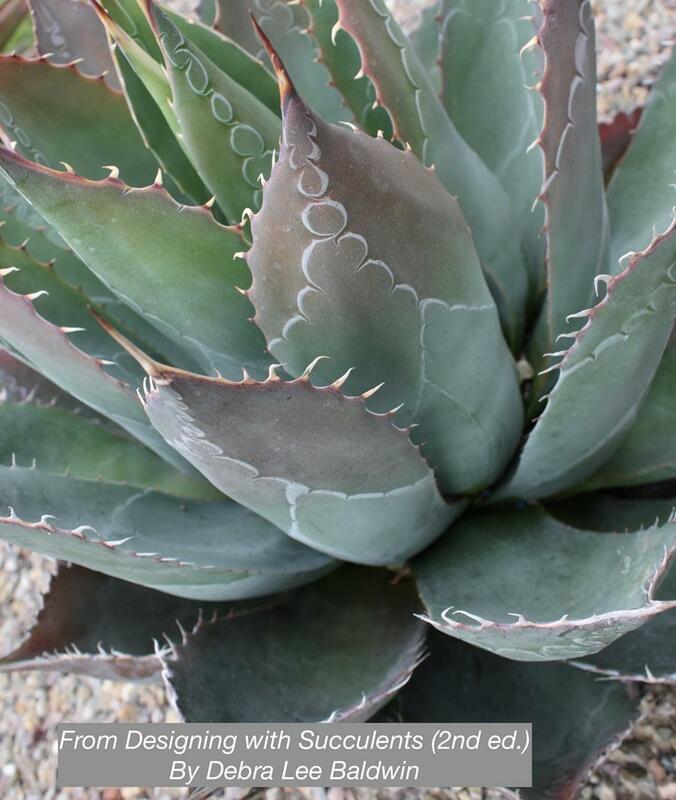 Scalloped patterns on an agave’s leaves (“bud imprints”) are caused by spines and teeth pressing into the flesh of inner leaves before they unfurl. Aren’t they fascinating? 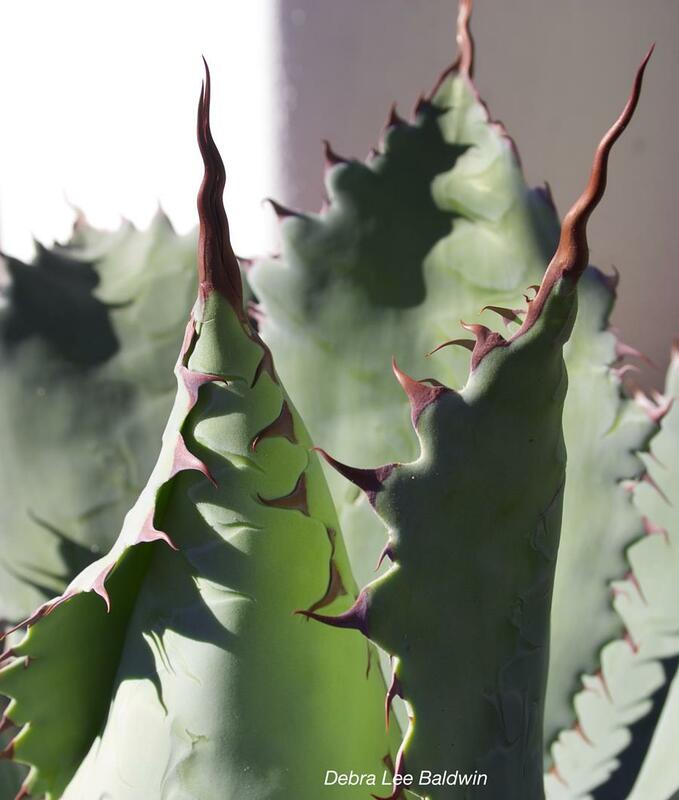 When pruning a damaged leaf, keep in mind that a straight-across cut at its midsection may spoil an agave’s symmetry. It’s best to make two cuts that trim the leaf to a “V” that resembles the leaf’s natural tip. Or cut it all the way to the trunk. One of the most common agaves, A. attenuata (foxtail agave) has soft, smooth, nonspiny leaves that are prone to sun scorch in summer and frost burn in winter. Damaged tips will collapse and turn white. If this has happened to yours, watch my short video on how to trim them. Large agaves that pup (not all do) can be thugs. They’ll grow and spread rapidly, especially when given good soil and regular irrigation. One of the most widely grown is A. americana (century plant), because it offsets so prolifically (free plants!) and needs no care at all…until those pups start to get big and form an unruly, ever-expanding colony. 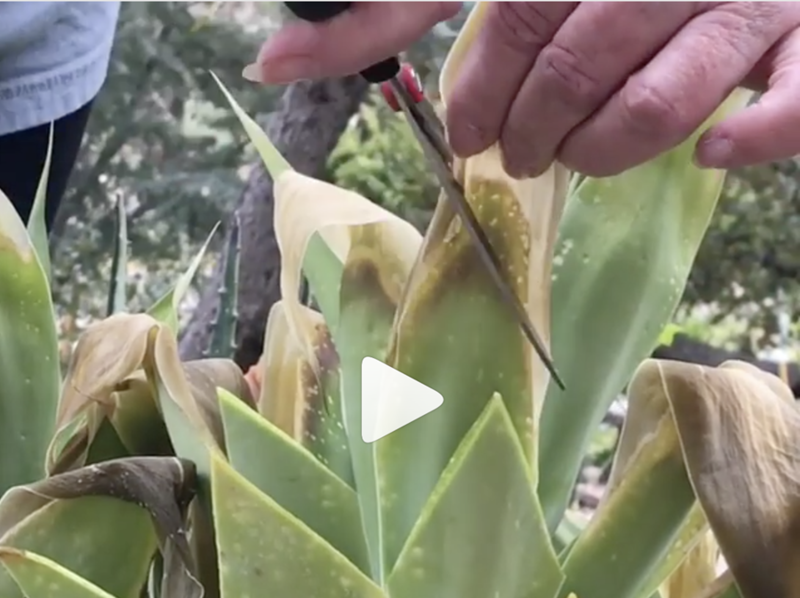 Because it seems that everyone is blithely planting Agave americana these days, agave expert Kelly Griffin and I made a video that gives better choices for the long run: Six Great Agaves for Your Garden. It’s the sequel to What You MUST Know About Century Plants (Agave americana). Being indigenous to the New World (the American Southwest, Mexico and Central America), larger agaves store enough moisture to get by on rainfall alone and will thrive in nutrient-poor soils. Although agaves like water, their roots—like those of most succulents—will rot in waterlogged soil. 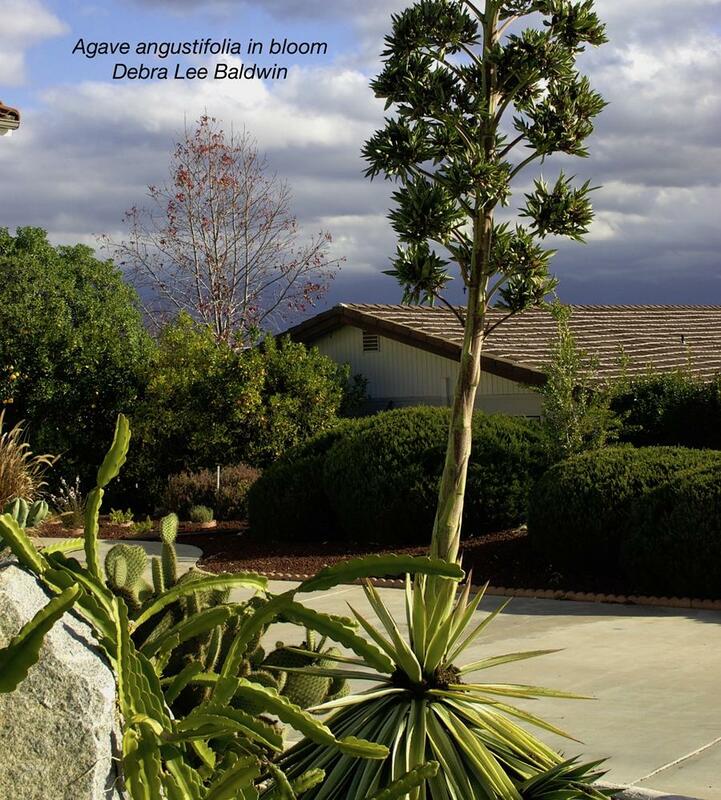 All but a few agaves are monocarpic, meaning they bloom once and then die. This may take as many as 25 years, but it will happen. As it completes its life cycle, a mature rosette that has graced a garden for years sends up an asparagus-like flower stalk (most, but not all, branch). This dwarfs the plant and saps its energy. Flowers along the stalk eventually turn into miniplants (bulbils) or seed capsules. Only the individual agave that flowers dies. In some cases—notably with those involving Agave americana—a litter of pups will carry on. 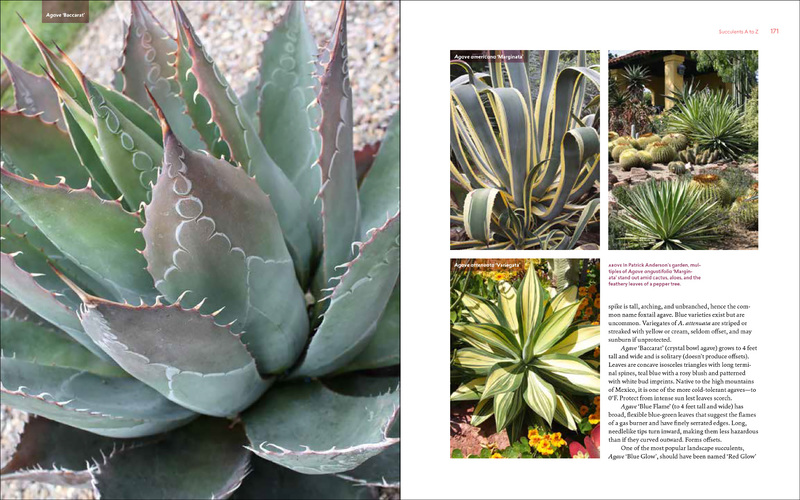 The above is edited from the intro to Agaves in “Succulents A to Z” in Designing with Succulents (2nd ed.). 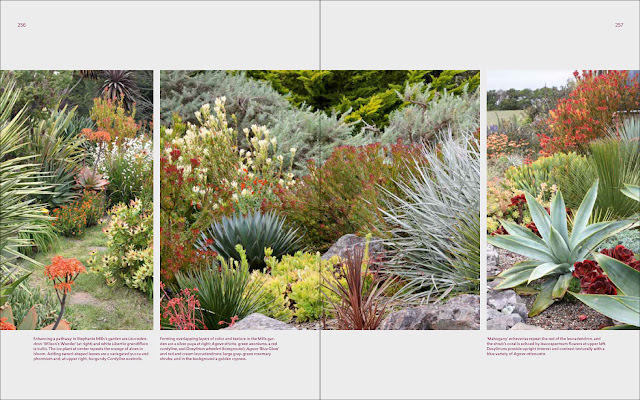 The book, which also covers Aloes among 30 important genera of succulents, includes photos and descriptions of significant varieties, and shows how to grow and use them beautifully in gardens and landscapes. Also see Succulents Simplified, pp. 177-184; this site’s Agave page; and my YouTube channel‘s Agave playlist. It’s a thrill for an author when a reviewer “gets” what a book’s all about. But succulent expert/blogger/photographer Gerhard Bock frankly floored me with his insights and evaluation of the second edition of Designing with Succulents. 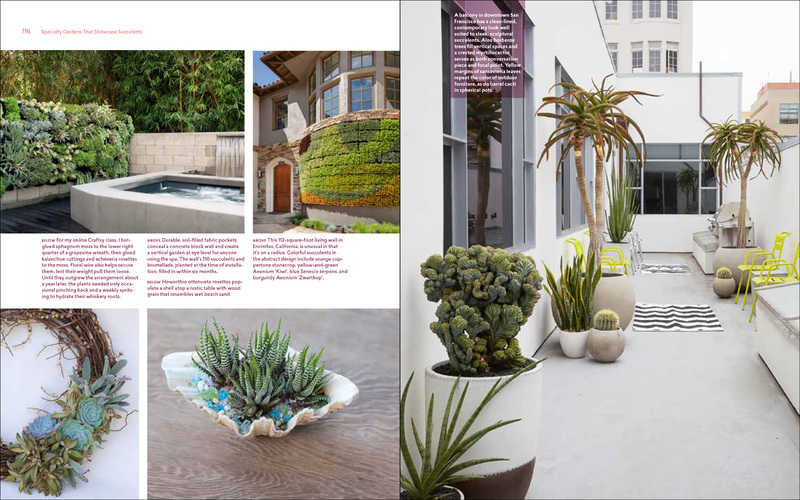 The world of succulent design has advanced so significantly since the first edition of Designing with Succulentswas released in 2007 that this second edition is a complete rewrite—in effect a new book. It showcases the cleverness and creativity of numerous designers and gardening enthusiasts, many of whom used the first edition as a starting point. Let’s talk a closer look at the book. Beyond the preface and introduction, it consists of six major sections. 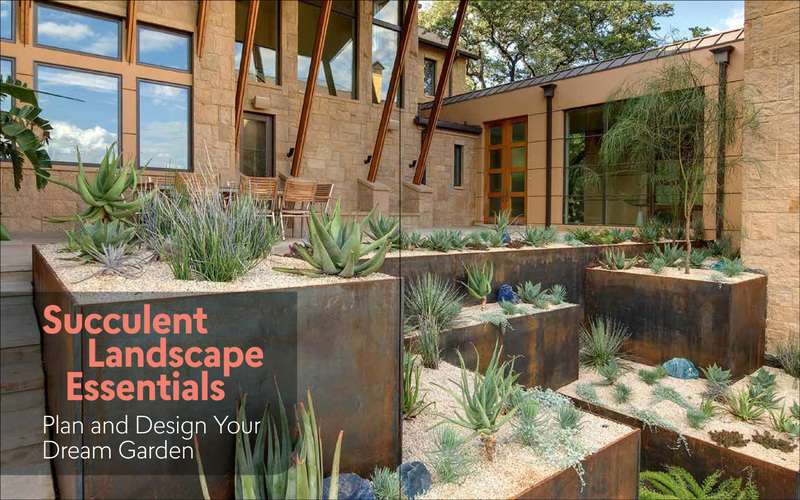 “Succulent Landscape Essentials: Plan and Design Your Dream Garden” covers basics such as site selection and soil preparation; design principles such as scale and proportion, repetition, contrast, emphasis, shape and texture, and color; hardscape elements such as walls, raised beds, pathways, and terraces; as well as outdoor art. “Specialty Gardens That Showcase Succulents” shows how succulents can be used in a variety of specific garden styles, including boulder and rock gardens, seaside and sea-themed gardens, desert gardens, firewise gardens, green roofs, container gardens, tapestry gardens, and miniature landscapes. “Success Secrets for Succulents” covers the basics of planting, watering and fertilizing, pest, damage and weed control as well as growing succulents in challenging climates—everything from hot and dry, rainy and humid, to cold climates. This chapters also touches on various propagation techniques. “Succulents A to Z” contains Debra’s “favorite foolhardy succulents for gardens large and small.” Organized in alphabetical order, this section describes the best species and cultivars from all common succulent genera—from aeoniums to yuccas. 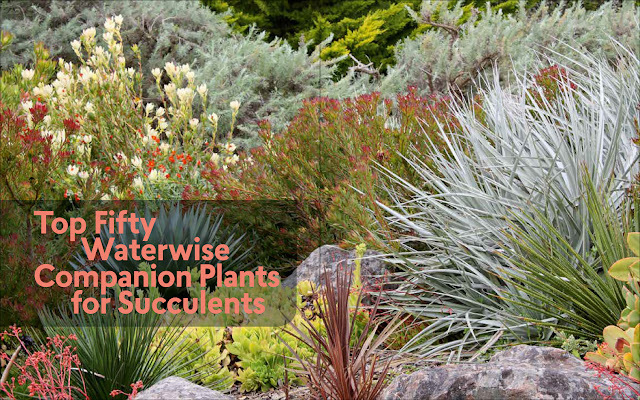 “Top Fifty Waterwise Companion Plants for Succulents” showcases a selection of trees, shrubs, perennials, and grasses that not only look good in combination with succulents but also share similar cultivation requirements. 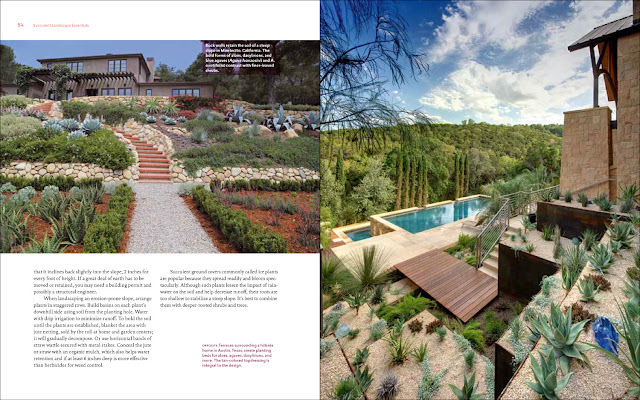 My favorite addition to the second edition are the Featured Gardens. 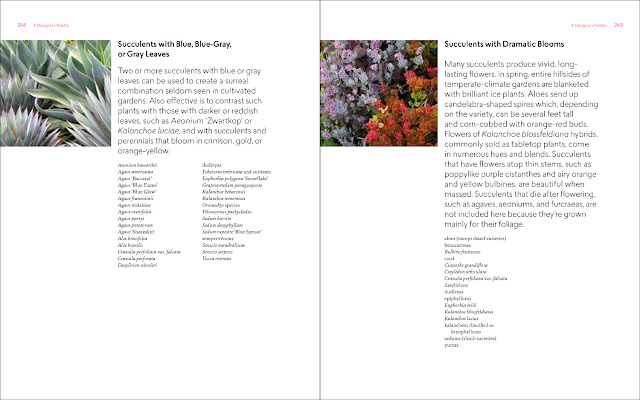 At the beginning of each section, Debra introduces us to a very special succulent-centric garden. 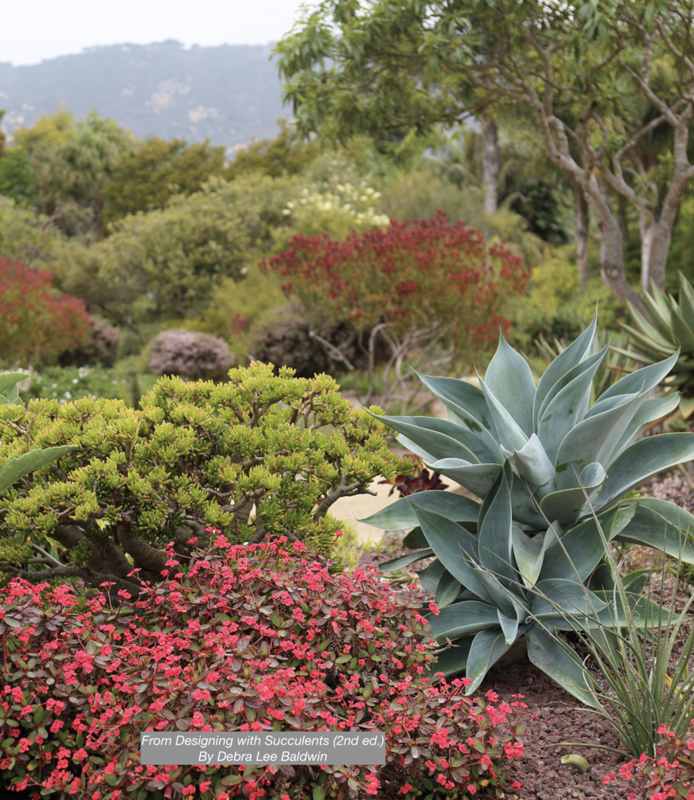 For example, she describes the evolution of her own ½ acre garden over the last ten years—in her words, “a giant editing job”—and takes us to other gardens in San Diego, on the Central Coast, and in Northern California. All these examples illustrate how harmoniously succulents blend into just about any garden style. What I noticed immediately when I received my copy of the book was its visual elegance. The superb page design, combined with arguably the best succulent photographs ever to to appear in a mainstream title, make the second edition of Designing with Succulents the most handsome commercially published gardening book I’ve ever seen. As a photographer, Debra does know that one well-chosen photo often stirs a reader’s imagination more than a page of even the most evocative prose. Still, without words to back up the images, visual beauty is just skin-deep. 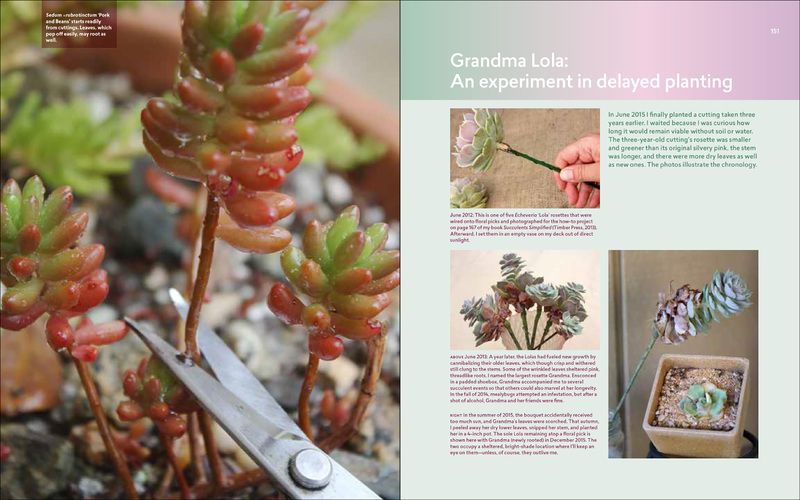 So while it’s possible to enjoy the second edition of Designing with Succulents as a lavish photo book, its real value is the wealth of information contained in its pages. Debra’s writing is clear as a bell and conveys even complex information without going over their heads. It simply is a joy to read.